For Health, Wellness, and Fitness.....It's a mindset....: Organic Wine. How Exactly is it Different? Organic Wine. How Exactly is it Different? Organic wines are made from organic grapes. No pesticides or preservatives are used in their production! Sulfites are a naturally occurring preservative in wine so all wine has some sulfites. Wine that is not organic and has added perservative, about 10-20 times the sulfites as organically produced wine. Red wine doesn’t need sulfites, rose and white need more, and sweet wines have the most. Many people claim that red wine causes less headache and this could be the reason why. Sulfites have a reputation for aggravating an asthma condition and many people are allergic. You can find a few different brands of organic wine at your health food store and maybe even at the local grocer if it's a bit upscale. 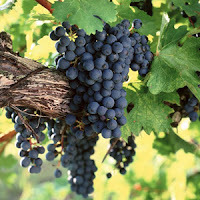 Organic wine is more popular in Europe but is growing in popularity here in the United States. Of course because organic wine is expensive to produce the majority of wineries shy away. It is currently thought by wine enthusiasts that the production of organic wine will grow in popularity as a niche of its own. So, if you’ve never tried organic wine, give it a whirl! Once you’ve tried it you may never go back……………. I looked around and found this online wine company click right here to check it out!